Today, we dig deep to bring you the inside scoop on what makes this sportsbook ideal and what you should know about before signing up. The truth about sportsbooks is that, for the most part, the lines are usually within a few hairs of one another. Yes, one site might have better odds on one game over another, but in the end, it usually balances out. 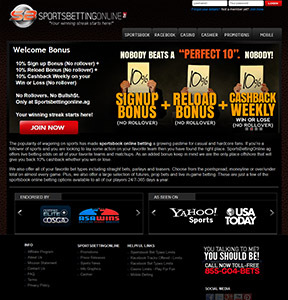 Sportsbooks typically compete in the bonus department to get players signed up. They usually offer 100% bonuses and promise to pack your pockets with thousands in cash. Once you deposit, you realize that you need to bet thousands to see a few bucks in real cash. SportsBettinOnline.ag is different. They offer the Perfect 10 promo, arming you with a 10% deposit bonus with no rollovers, a 10% reload bonus with no rollovers, and 10% cash back weekly, win or lose, with no rollovers. You can’t find this bonus structure at any other online sportsbook, which makes SportsBettingOnline.ag one of the most popular books on the planet. As far as sports betting goes, SportsBettingOnline.ag is the cream of the crop. But unlike some of the competition, SBO lacks an online poker portal. Yes, they do offer a full-fledged online casino and a solid mobile betting platform, but if you’re looking for a single platform to enjoy betting and online poker, you’ll need to look elsewhere.